Hey Coffeeholics! One of the wonderful things that I love about Christmas is that you can see it, feel it, and taste it in the air here in the Philippines. Especially during the night. If you go around Metro Manila, you can see all these bright, cheery, twinkling lights that just sings.. "Its Christmas Time!" 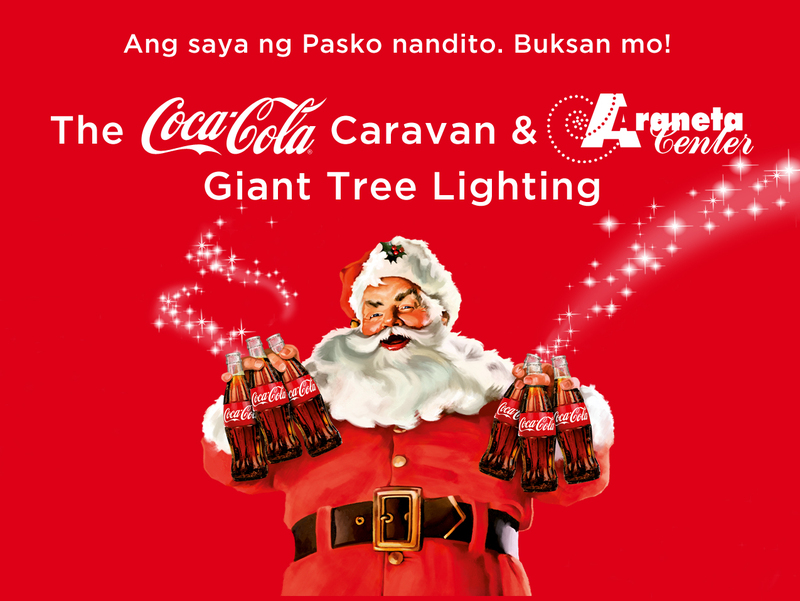 So I was quite privileged when I was able to attend the Coca-Cola Caravan and Araneta Center Giant Tree Lighting event last November 12, 2011. Yes, CHRISTMAS here in the Philippines begins in November! Once the "-ber" months kick in, you can sense Christmas coming. But it all goes full blast and Coca-Cola definitely kicked it off by transforming the Araneta Coliseum parking lot into a magically transformed Christmasville. Of course the star of the show was the Giant Christmas Tree which was made grander and even more sparkling this year. In fact, it's the 30th year this custom was celebrated. Standing at almost 100ft. this year’s tree is bedecked with more than 10,000 lights and hundreds of stars and Coca-Cola Christmas balls, with huge ribbons and colorful gift boxes as accents. Through the years, it has been a beacon of hope among the Filipinos; a most cherished icon that signals the beginning of the holiday season and reminds us to always believe in the magic and happiness it brings, the same way Coca-Cola inspires. A special toast and an awe-inspiring fireworks display followed once the tree has been fully lit and glowing. So yeah, Christmas ain't Christmas here in the Philippines without all that lovely lights and Christmas decors! Of course the Christmas tree wasn't just the focus. The Coca-Cola Music Bus spread Yuletide cheer as well with gifts and free COKE of course! Food stalls were abundant and the food disappeared fast. Still the caravan area looked interesting especially since there were areas where people could have their photos taken with a lot of Coca-cola related props and items. Of course Coca-cola definitely knows how to throw a party at the parking lot of Araneta Coliseum with its song and dance numbers by celebrities of different stations. It was awesome seeing all of them join together as one big happy family -- Coca-Cola ambassadors Kathryn Bernardo, Joseph Marco, Julia Montes and Enchong Dee; with ABS-CBN young idols Empress Schuck, Jessy Mendiola and Arron Villaflor along with GMA stars Kris Bernal, Rocco Nacino, Steven Silva, Sef Cadayona, Diva Montelaba, Barbie Forteza and Joshua Dionisio. And yes, that’s not all! The food party and tree lighting extravaganza were followed by a jam-packed dance concert featuring the young stars and the hottest Pinoy bands of today, the Aspog Band and Spongecola. It was a musical showdown like no other, leaving everyone who joined the party on high spirits. Me and Sofi enjoying a bottle of FREE Coke and watching the concert during the event! Throughout the night, Coca-Cola ambassadors also gave away special raffle prizes. What did these lucky guests get? Big red boxes filled with surprising Christmas treats, perfect for sharing and spreading the love this Christmastime! Well, you could get one for yourself or the whole family when you join the Coca-Cola Christmas Box Surprize Promo. In this easy-win promo, you not only get the chance to win Noche Buena gift baskets, Coca-Cola products, Bench gift certificates, cool gadgets like iPads, digital cameras, PS3s, Wii and others, you might also take home a whopping Php 1M pesos! Open holiday happiness now for people you cherished most with a Coca-Cola Christmas Box! Just follow these simple steps: (1) Drink Coke, Coke Zero, Sprite or Royal Tru Orange in any 400ml, 500mL, 750mL, 1Liter, 1.25L, 1.5Liter or 2Liter packs; (2) Collect 2 caps in exchange for 1 raffle coupon which may be claimed at participating sari-sari stores, public market stalls, Coke sales offices and Coke Dealers redemption centers from November 1 to December 30, 2011 only; (3) Text in the code in the coupon to join the electronic raffle. It’s that easy! Winners will be selected per area nationwide, daily. The Coca-Cola Christmas Boxes will be delivered right to the winners’ doorsteps! See posters and visit coca-cola.com.ph for more details. The annual celebration of food, music and happiness surely took to a whole new high with fun and heartwarming moments shared only in the best of ways. The season of true joy is now officially opened and refreshed! Now, don’t you just wish it’s Christmas day, everyday? For more updates and highlights of the caravan, visit the Coca-Cola fan page on Facebook or go to coca-cola.com.ph. Para sa Pagsasamang Hahanap-hanapin. Open Coca-Cola, Open Happiness. Oh and by the way, have you watched the latest video from Coca-cola? Its their latest campaign and a sure tear-jerker. The first time I watched this was on the smartphone of one of my friends and the next thing we knew, we were all tearing up, sniffing, and agreeing that this was definitely one of the coolest and most touching campaign Coca-cola has done here in the Philippines. You should watch this and let me know what you think! Agree ba agree? Hehe!